Estela Baz , former student of the class of 94 at SEK-El Castillo has recently published her new book, Los niños de Lemóniz (Editorial Espasa), a story based on real events of children who were cruelly affected by ETA’s terrorism, told in the voice of a girl who suffered, between the ages of three and seven, fear and incomprehension in the face of terror and violence, in the midst of a decisive period in our recent history. On 1 February 2019, Estela Baz presented her book at the Fernando Buesa Blanco Foundation alongside the Memorial Centre for the Victims of Terrorism in Vitoria. On 7 February, Estela Baz, together with the well-known journalist and radio broadcaster, Luis del Olmo, who wrote the prologue of the book, presented the book at the Fnac in Callao, Madrid. 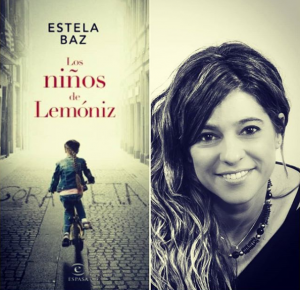 This is not Estela Baz’s first book, in 2016, and with the help of Grupo Planeta, she published the book entitled 37 almas en una, of which she is also co-author, and in 2017 she participated as a collaborator in the book Mírame España, published by Accenture. If you wish to purchase Estela’s new book, you can find it in any Spanish book shop and online at La casa del libro , Fnac , Planeta de libros , Amazon , among other online retailers.